About project – Mercedes-Benz India Ltd.
With a premises boasting of around 1400 mature trees and a recent addition of more than a 1000 plants, we at Mercedes-Benz India Pvt. Ltd. are focusing on increasing our green cover to support the surrounding environment, its ecology and the biodiversity it sustains. This venture aims at establishing a robust monitoring system which will facilitate long-term monitoring of the plants on the company premises by tracking parameters like their health, amount of Carbon dioxide sequesteredetc. Combined with this is a unique and interactive feature which enables visitors and employees alike to learn more about the rich floral diversity around them and its role in the ecosystem in an interesting and informative way. This venture involves locating every tree on the premises, recording required parameters like itsbotanical name, girth, height, GPS location etc. and designating each individual tree with a unique QR code. The gathered data is then stored in an online database using a web-based application developed exclusively for this initiative. This data is further supplemented with information such as the Medicinal and Ecological significance of the tree species, estimated Carbon stored and CO2sequestered by the individual etc. 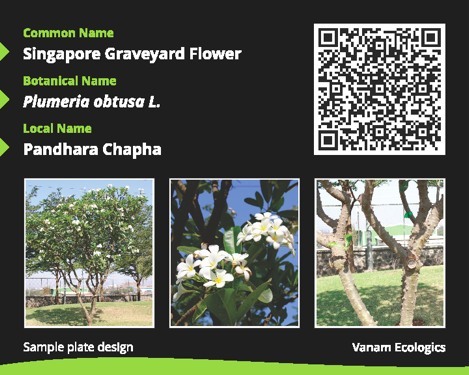 This information can be accessed by anyone simply by scanning the QR code presented near each tree using any Smart phone with a QR scanner and following the given web link. Not only does this venture use technology to monitor the plant diversity, but also to facilitate environment awareness, hence becoming a unique and valuable initiative. Download any QR code scanning app in your mobile or tab. Stand in front of the Plant tag. Scan the QR code on the plant tag. You will be redirected to tree information page.